Wembley began as a settlement beside the ancient Harrow Road, part of the manor of Harrow. In 1792, Humphrey Repton was employed by the Page family to convert their farmland into a country estate, which became known as Wembley Park. In 1880 the Metropolitan Railway extended their lines through Wembley Park to Harrow, buying a portion of land from John Gray to do so. before nine years later buying the whole of Wembley Park. This would be a pivotal moment in the history of the Wembley and the suburbs, and would lead the way to the creation of Metro-Land. The Metropolitan Railway, led by Sir Edward Watkin, wanted to turn Wembley Park into a perfect suburb full of commuters using the Met to get to work in London. Of course Wembley was still some distance from what was then considered London, and so a means of attraction was needed to bring people out. This was to be Watkins Tower and the pleasure grounds built around it. Designed to exceed the newly built Eiffel Tower, the firm of Stewart, MacLaren and Dunn won the design competition with a plan for 1200 ft steel tower The tower was to include restaurants, theatres, ballrooms, a hotel and a sanitorium. Building began in 1892 with it opening to visitors four years later when the building had reached 155 ft. The design had been switched from 8 legs to 4 to save money, but that choice would led to major subsidence. After a busy beginning, the crowds dried up and the money for the construction ran out. In 1902 the tower was deemed unsafe, and it was decided to demolish the half built tower, with the foundations being dynamited in 1907. The area around the pleasure ground started to be developed, with houses being built to form Wembley Park Village, all in the tudorbethan style. The next event to draw people to Wembley was the British Empire Exhibition of 1924. The exhibition was planned with the stated aim of an exhibition "... to enable all who owe allegiance to the British flag to meet on common ground and learn to know each other.”. The design of the exhibition buildings was largely by Maxwell Ayrton and John Simpson, with Owen Williams appointed as the engineer. They designed and built a range of buildings in the Beaux Arts style, including national pavilions for almost every country in the Empire, as well as pleasure gardens, shops, restaurants and an amusement park. However the centrepieces of the site were to be the Palaces of Industry, Arts, Engineering and Horticulture, alongside a national sports stadium. The national sports stadium proved to be the most famous building constructed for the exhibition, the Empire Stadium. Known worldwide as Wembley Stadium, the home of English football. The stadium and its iconic towers lasted until 2003 when it was demolished to make way for the new stadium on the same site by Foster + Partners and Populous. The national pavilions reflected each countries architectural styles, with Buddhist temples , Chinese markets and African huts appearing in the Middlesex countryside. The design of the Palaces were much less exotic but just as impressive. When completed, the Palace of Engineering was the largest reinforced concrete building in the world. It covered 13 acres and featured five internal railway lines to help move the exhibits. Like all the buildings in the exhibition, the Palace of Engineering was intended to be temporary, but managed to survive until the 1970’s. 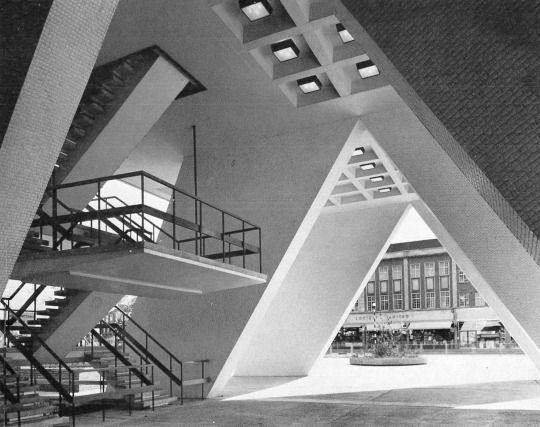 The Palace of Arts lasted until 2006, when it was demolished to make way for a car park. 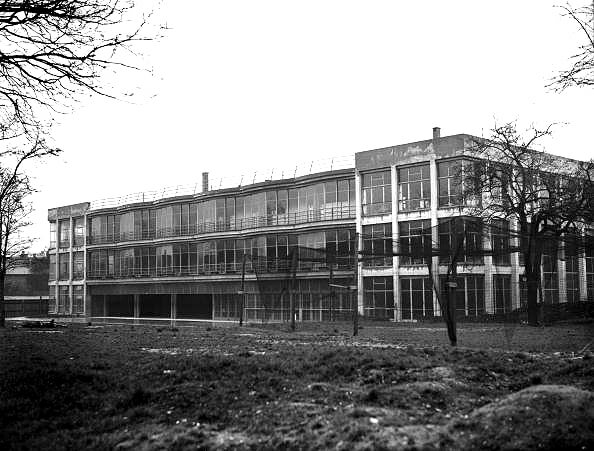 The Palace of Industry managed to last until 2013. slightly smaller the the Palace of Engineering, at 10 acres, it is made up of a number of halls enclosed with glazed pitched roofs. The pre-cast concrete was reinforced and partly painted and channelled to appear like stone. It was the first building in Britain to use concrete for external as well as internal support, and despite its classical style, it had a hulking, modern look. The site also included a bridge, praised by Ian Nairn in his “Nairns’ London”, “a concrete bridge moulders away among the weeping willows and beer cans. Crisp and angular, it must be one of the best things we did in the twenties- true English modernism”. The only two remnants of the exhibition are what is left of the India Pavilion and a refreshment hall. 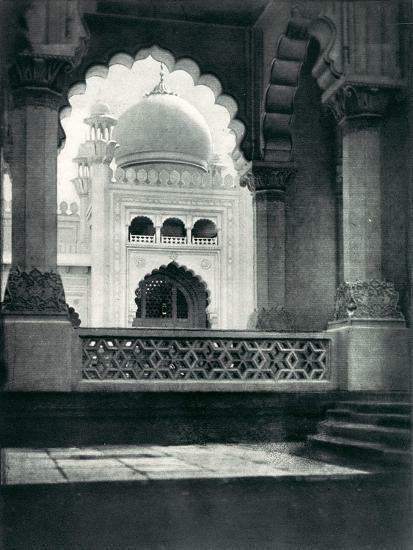 The India Pavilion was jointly modelled on the Jama Masjid in Dehli and the Taj Mahal in Agra and designed by the firm of Sir Charles Allen and Sons. Inside it was divided into 27 courts each focusing on products from the 27 provinces of India. Unfortunately the centrepiece central dome section is no longer there, but the the flanking buildings remain. These buildings have been turned into businesses, one is Latif Rugs, the other is Stonemanor Ltd. A bit further west is the former refreshment hall, now home to several companies, including Rubicon the soft drinks manufacturer. (For comparison the 2011 population was 90,045). The British Empire Exhibition has all but disappeared, with only a few remaining relics, subsumed under Wembley’s ferocious bid to reinvent itself as the Stratford of the West. The exhibition is not as fondly remembered as the Festival of Britain 27 years later, it’s title and aim seeming antiquated in the 21st century compared to the futuristic buildings that appeared on the South Bank. But it is a shame that some of the buildings by Ayrton and Williams have not been preserved, considering their pioneering construction, as well as their place in the growth of the suburbs. These notes were first written for the 20th Century Society tour "Wembley and the Making of Metro-Land" held onSaturday 27th October 2018. 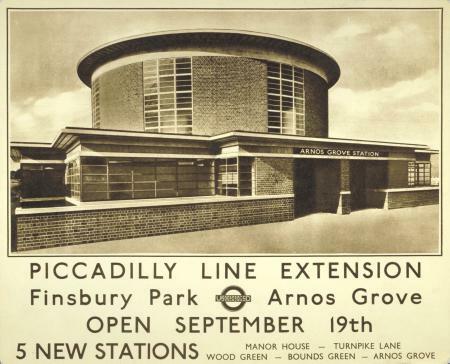 The Piccadilly line had finally extended out east from Finsbury Park in 1932, with Charles Holden's new stations reaching up to Cockfosters. Those eight stations were among the first set of public, modernist buildings, a coherent set of designs opening between September 1932 and July 1933. The western extension stations did not open in the same way. They appeared here and there from 1931, with new stations being built until 1938. One of the earliest and most influential was Sudbury Town, opening in 1931, the first appearance of Holden's “Sudbury Box”, a design that he would tinker with for the rest of the decade. 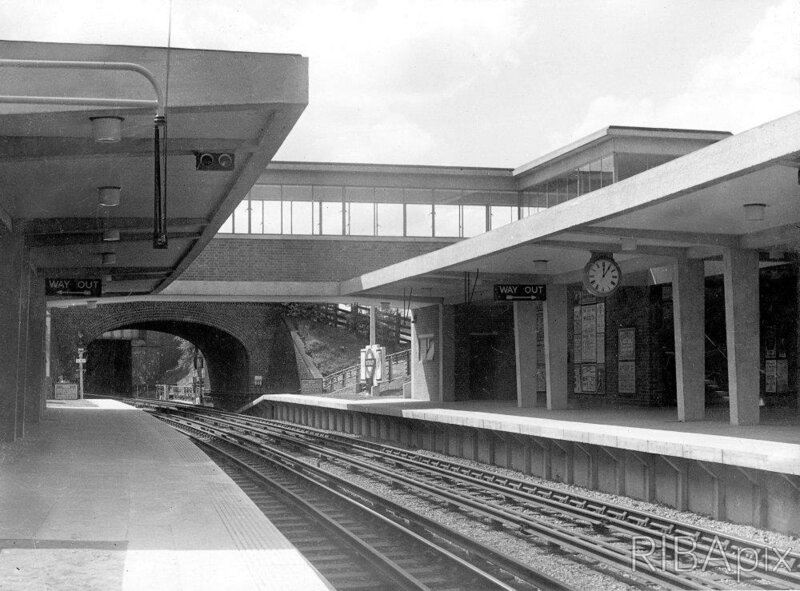 The stations of Boston Manor and Osterley, part of the extension to Hounslow, were both opened a few days apart in March 1934. Osterley opened first on March 25th, alongside the Great West Road, only 10 years old at that point. The station had been relocated from the earlier Osterley & Spring Grove station which had been located 300m away. The design of the new station departs somewhat from the previous box designs used elsewhere on the line, by introducing a thin finial tower on top of a low station building. The original design for the station was prepared by Stanley Heaps, chief architect to London Underground, with a large box style station. This design was set aside and Charles Holden and his assistant Charles Hutton produced a new more compact design, largely the one we see today. The 70ft high tower acts as a prominent advert for the station and the Underground, helping the one storey station stand out alongside the busy road. 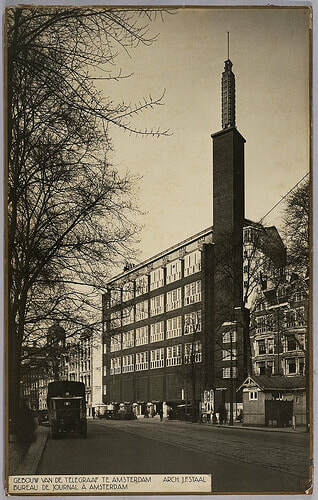 The concrete finial on the tower seems to be influenced by a similar design on top of De Telegraaf building, Amsterdam (1930) by J.F Staaf & G.J. Langhout. A long glazed corridor was included in the design of the passengers footbridge over the platforms. Boston Manor, one stop east from Osterley, was opened on March 25th 1934. The new building replaced the original station which opened in 1883 as Boston Road. The station was again designed by Charles Holden with Charles Hutton, and once more the design breaks with the previous rectangular standard. 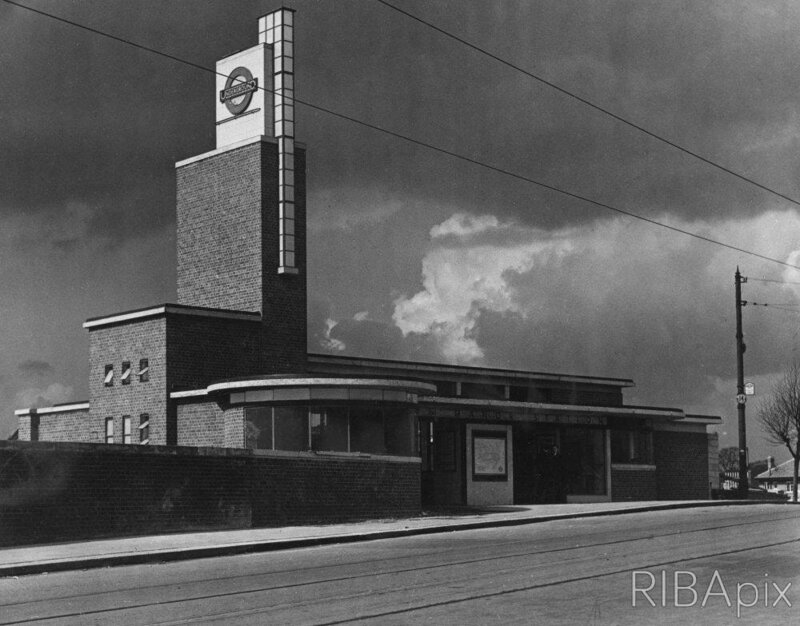 Like Osterley, the plan consists of a low station building, topped by an eye catching structure, this time a slim tower featuring glass bricks, and a back-lit bar and roundel symbol, showing a strong Constructivist influence, and very reminiscent of Dutch architect Jan Bujis’ De Volharding Building in The Hague (1928). Holden and the CEO of London Transport, Frank Pick, had taken a trip to Europe to see the new modernist designs of the continent in 1930. They visited Germany, Denmark, Sweden and the Netherlands, so it is very likely they saw both De Telegraaf and De Volharding buildings. The large area of glazing seen at Osterley was repeated here with a the panoramic window overlooking the platform area. Both buildings have a reinforced concrete frame with brown brick on the exterior. Both stations had had served the District line as well as the Piccadilly from their openings, with the District services were discontinued in 1964. Boston Manor station (1934) by Charles Holden. Image from RIBApix. The eye catching design of both stations was something encouraged by Frank Pick, who wanted the stations to stand out from their surroundings, and communicate speed, modernity and ease of use. Holden was more minded to use the box design he had first introduced at Sudbury Town, believing it to be the logical solution to problem of passenger flow. He would return to the box in his later stations such as Eastcote and Rayners Lane. 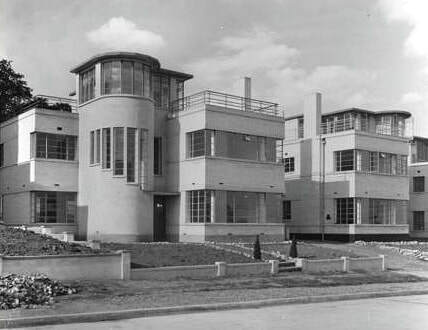 However, Osterley and Boston Manor are fascinating examples of the influence of Dutch architecture and the De Stijl art movement on Holden and British interwar architecture. 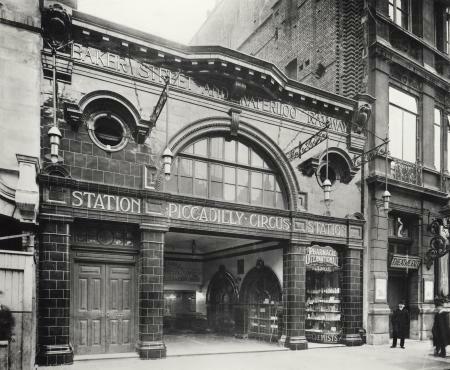 Piccadilly Circus Station, Jermyn St Entrance (1906) by Leslie Green. 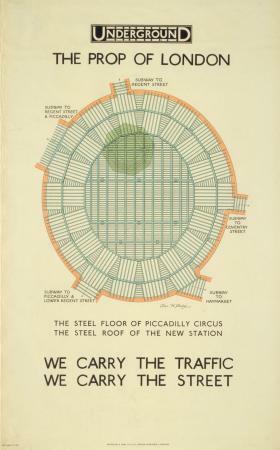 Image from London Transport Museum. The only space to build the substantial new booking hall area was underground. Charles Holden, who had been bought into the fold by Frank Pick a couple of years earlier, designed the new station. Work began on the new booking hall in February 1925, with the new hall opening on 15th December 1928. The old booking hall stayed open until 1929, and was demolished in the 1980’s. 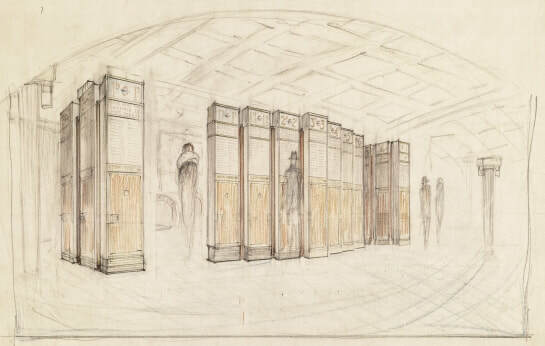 Charles Holden’s new design created an underground elliptical ticket hall with several entrances from street level. Something similar had been built at Bank a couple of years earlier, but Holdens design bought an elegant solution to the problem of passenger circulation. The ticket hall roof is formed of reinforced concrete supported by seven steel columns, with another 50 smaller columns around the hall. The project required a complex arrangement of tunnels to serve as passenger escalators up and down to the platforms; something best seen in Renzo Picasso’s illustration. Holden’s design for the station did not involve the engineering side, which was already underway when Holden was bought into the project, but his station design but a beautiful face on an awkward arrangement. The station plan mirrors the above ground circus laid out by John Nash in 1819. The interior of the ticket hall was finished in cream travertine marble, with bronze metalwork used for one of the first times on a London Transport building and white tiles for the flooring. Above the escalator, a mural by Stephen Bone was commissioned, showing London as the centre of the world, and Piccadilly Circus as the centre of London. The world clock also links the station and London to the rest of the world, turning in time with the spinning of the Earth, allowing passengers to see what time it is in a place of their choosing. The ticket hall also featured a variety of shops, allowing for all weather shopping. Sketch, Ticket Machines, Piccadilly Circus Station. Image from Le Cool. The finished result was widely praised and visited, notably by members of the Moscow Government who were looking for inspiration in creating a new subway in the Soviet city. Nikita Khrushchev would lead the city authority in building the spectacular stations of the Moscow Metro, and in turn would influence Holden in his design for Gants Hill station. Architect Erich Mendelsohn was also a fan of Piccadilly Circus, once sending Holden a Christmas card reading “wishing you many more Piccadilly Circuses”. Piccadilly Circus Station Refurbishment (1984-6) by London Transport Arch Dept. Image from London Transport Museum. The station was renovated in the 1984 and Grade II listed the same year. In 2016 an artwork by Langlands and Bell was installed to coincide with the 75th anniversary of the death of Frank Pick. As of 2016, the station has nearly 42 million entrances and exits by passengers, but still Holden’s design endures, allowing passengers to circulate to their destinations as the buses and cars do above them. Finsbury Health Centre opened on 21st October 1938, and was praised for its architectural design as well as its moral purpose, two things that were seen to go hand in hand. A number of health centres in the art deco or modernist style had been built in London and beyond in the interwar years; Owen Williams’ Pioneer Centre in Peckham being the most famous. But Berthold Lubetkin and Tecton’s design for Finsbury Borough set new standards in modernist architecture and in public health in Britain. Pioneer Health Centre, Peckham (1935) by Owen Williams. Image from Getty Images. Lubetkin and Tecton had previously designed a health centre for Dr Philip Ellman in 1932. The building was to be a TB centre in East Ham. The flexible design was shown at the British Medical Association Congress in 1933, and was well received. However the centre did not come to fruition, but a visitor to the BMA congress was a Dr. Katial, Chairman of the Public Health Committee of Finsbury Council, who would commission the Finsbury Health Centre in 1935. Mural, Finsbury Health Centre (1938) by Gordon Cullen. Image from RIBApix. The building in Finsbury featured TB and foot clinics, a solarium, a dentist, a decontamination zone and a mortuary. It also catered to the mind as well as the body, featuring a lecture theatre and murals by Gordon Cullen. The structure itself was built from reinforced concrete in a H plan with two flanking wings, with a curved frontage, something Lubetkin likened to a "smile on the front of the machine". The building is finished in faience tiling, glass bricks, and brass, copper & teak framing. The centre even featured chairs designed by Finnish architect and designer Alvar Aalto. The interior was arranged to be more like a drop in centre than a formal doctors waiting room; there was no reception desk (one was added later) and the waiting area seating was loosely arranged rather than in the traditional rows. Exhibition display panels explaining features of the design of Finsbury Health Centre (1938). Image from RIBApix. The health centre and the wider Finsbury Plan was part of a progressive socialist movement of the war years; one that would eventually see Clement Attlee's Labour party sweep to power in 1945. This was made explicit in Abram Games 1943 propaganda poster featuring the health centre, “Your Britain-Fight for it Now”, which was apparently banned at the behest of Winston Churchill. The buildings mix of forward looking design and public responsibility, as well as its balance of physical and mental elements, set a tone for the post war architectural period with its outpouring of state sanctioned design. Lubetkin and Tecton would build further projects in Finsbury; the estates in Priory Green and Spa Green; but never again would this partnership of design and purpose by realized so well. And unlike the previously mentioned Pioneer Centre, which is now an apartment block, the Finsbury Health Centre is serving patients to this day. The new Victoria underground service opened with little fanfare on Sunday 1st September 1968, with the first train leaving for Highbury & Islington from Walthamstow (which was then the extent of the line) at 6:30am. Three months later to the day, the next section opened, south from Highbury & Islington to Warren Street. The new line did finally get an official ceremony, with the Queen unveiling a commemorative plaque at Victoria station on March 9th 1969, and taking a short tube trip to Green Park, becoming the first reigning monarch to take the underground. The grand station had been linked up to its tube line progeny two days earlier, with another extension to Brixton being completed in July 1971. The line had first been mooted in 1937, connecting North East London to the centre. After much to and froing, a Parliamentary Bill for ‘Route C’ from Walthamstow to Victoria was passed in 1955, with an extension to Brixton added in 1965. The name of the new line took some different forms, with a Bakerloo style portmanteau name favoured, with the results being “Walvic” (Walthamstow-Victoria) and “Viking” (Victoria-Kings Cross). Eventually “Victoria” was suggested and passed for use. Compared to its illustrious forebears, such as the Piccadilly Line, or future feats like the Jubilee line, visually the Victoria Line lacks the ‘Wow’ factor. However the line does have some design features worth exploring. Blackhorse Station relief (David McFall) and mosiac (Trata Drescha) 1968. Image from VADS. 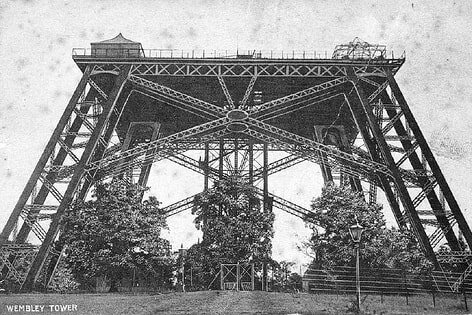 The new line did not have many new stations built for it, mostly using connecting stations that were already were part of the London Underground network. A new station building was built at Blackhorse Road, opening on September 1st along with the line itself. The station is in the tradition of the Charles Holden Sudbury Box, with a spacious rectangular ticket hall in dark brick. The real interest lies in its artworks, featuring a fiberglass relief of a black horse by David McFall, which is surrounded by a mosaic created by Trata Drescha. Bridge of Signs, Tottenham Hale station by Bruce MacLean. Image from Flickr. Tottenham Hale is the next station south on the line, and not much to write home about with constant rebuildings and additions muddling any coherent idea (it is currently undergoing another redevelopment). However it does have a great, futuristic bus waiting room designed by Alsop Lyall & Stormer from 1992. It comprises a tunnel shaped waiting room, featuring porthole windows and a 50 metre artwork by Bruce Maclean. MacLean, designed three artworks for Tottenham Hale, Path of the People (the 50 meter mural), Bridge of Signs (a fountain) and Tower of Time (a blue beacon), but the last two have now been demolished. Brixton Tube Station 1971. Image from Urban75. At the other end of the line, Stockwell was given a new station building as well. 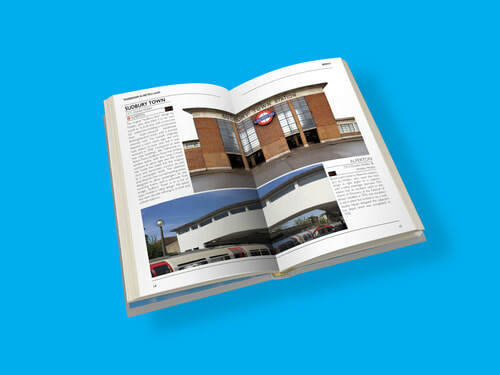 It was in keeping with Blackhorse Road and Tottenham Hale in being a rather dour design, with a single storey entrance hall balanced next to the ventilation tower in dark brick. Flats have now been added above the station in the same dark brick. Brixton station was given a new entrance as well, in similar muted colours as the rest of the line. The station was rebuilt between 2001-2010 with a modern update of the Holden style ticket hall with generous glazing. Victoria Line tile designs/ Image from Art on the Underground. 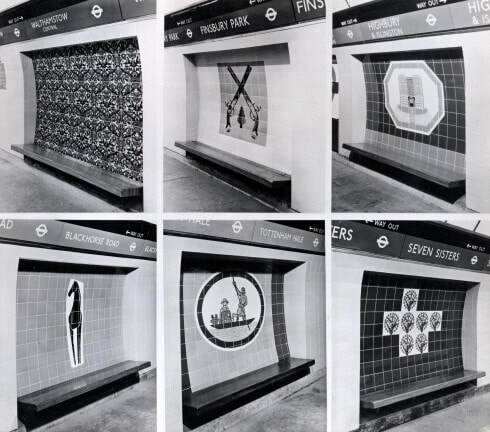 All of the Victoria Line stations feature unique tile work mosaics at platform level by Hans Unger and others, reflecting the history of the local area, something that had been done on the Piccadilly Line by Harold Stabler's ventilation grilles. The designs range from the straightforward, a black horse at Blackhorse station to the more abstract, such as the Abram Games swan design for Stockwell. Apart from the mosicas, the overall Victoria Line platform designs were very muted, with a colour palette of grey, black and white set out by Mischa Black of the Design Research Unit, in charge of the design of the new line. 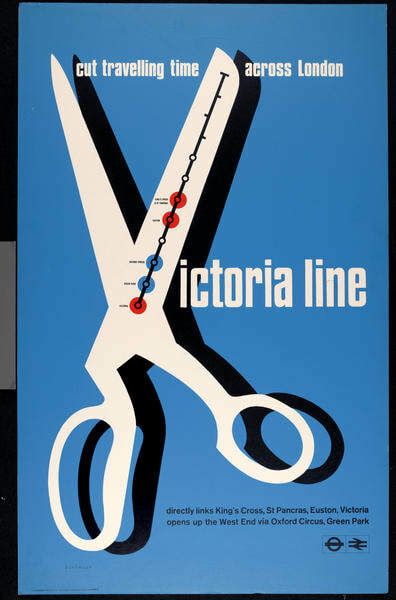 Victoria Line Poster by Tom Eckersley 1968. Image from VADS. 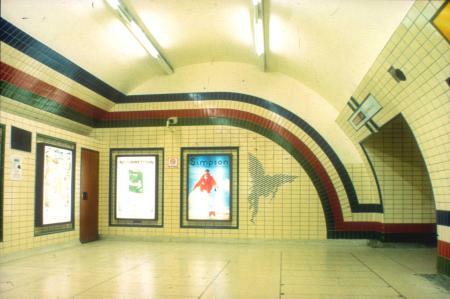 An area where colour reigned supreme however, were the new posters advertising the line, with designs by many of the same artist who designed the platform mosaics. Tom Eckersley, Hans Unger, Denys Nicholls and William Fenton all produced posters influenced by contemporary styles such as Pop and Abstract art to advertise the new line. So while the Victoria Line is not as highly thought of in architecture terms as the Piccadilly or Jubilee Lines, there are plenty of design elements to look out for next time you take ‘Route C’! 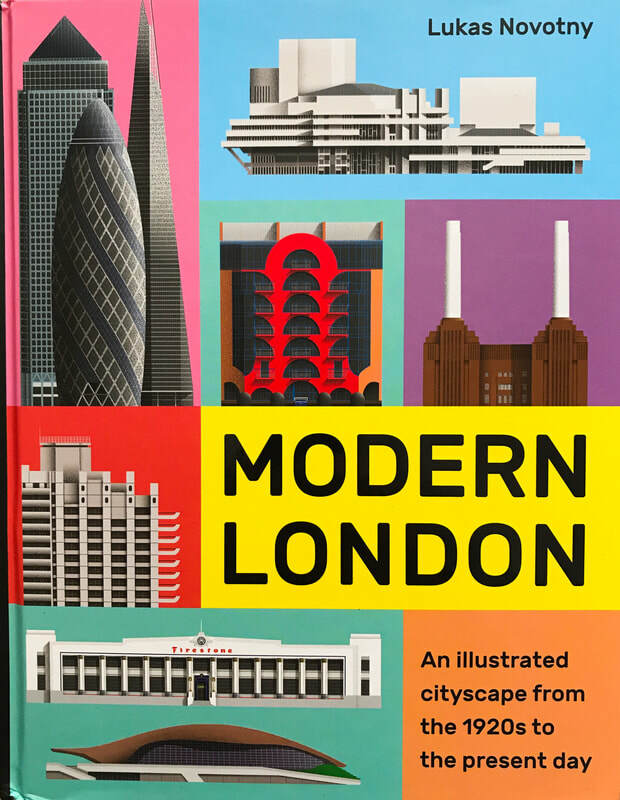 A Guide to Modernism in Metro-Land, our guidebook to the suburbs best art deco, modernist & brutalist buildings is crowdfunding now. Go HERE to get your copy.